Leslie's Loops Craft Corner: Cute Babies and Baby Stuff - UPDATE! Cute Babies and Baby Stuff - UPDATE! I've changed the picture of the bunny outfit. I think you'll love it!! I'm so excited! My facebook page - Leslie's Crochet Creations - has reached over 100 "likers"! Now, on 2/1/13, I'm going to have a drawing for a queen sized afghan! Did you like my facebook page? If so, you'll be entered to win! If not, like the page by 2/1/13, and you'll automatically be entered! This set is for a couple having their first child. I made a sweater, but I didn't post it... anyway, let me tell you where this came from. The blanket - it's the 2-sided afghan by Janet David. It was so easy to make, and it was such a therapeutic stitch... you know the ones that are almost like popping bubble wrap? Yeah, it was like that. The booties are the 5 minute baby bootie from sewhooked.com. I have struggled with booties before, and these came out so well. I was very excited! The hat is an adorable shell stitch beanie from ravelry.com. I'm a woman who likes beautiful and easy, so if you're a beginner, these should be no problem for you. This has to be the CUTEST picture I've seen in a long time! It looks so much better than the picture I took of it on the couch... thanks to The Beauty In It Photography! 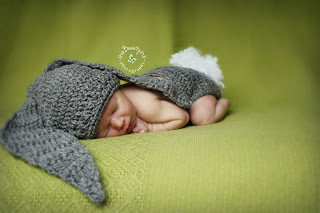 This cute little bunny was made by me studying crochet bunny ears on ravelry and pinterest. It took several attempts, but I was able to increase and decrease in the perfect areas to make these cute ears. The diaper cover is from this newborn diaper cover pattern. I fluffed up a pom pom and added it to the back for the tail. This adorable mermaid costume is for photos, and the pattern is here. I made the bikini top myself by making two triangles and adding chains. Again, very easy and fun to make. I'm going to start the afghan tomorrow. When I choose the winner, I'll post it here on this blog with a picture of the afghan. Anyway guys, until next time! !